The most recent episode of Supernatural brings back a major hanging plotline focusing on one of the major secondary characters in the series. Bobby Singer is a sort of mentor and father figure to the boys, the closest thing they have left to family (except, of course, for the sudden arrival of their previously-deceased grandfather and an entire family of hunters they never knew about). 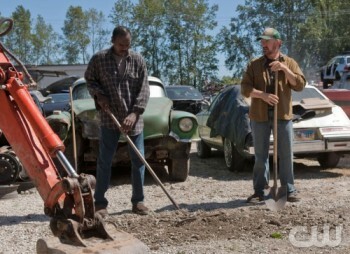 Bobby Singer (right) helps Rufus Turner (left) dispose of the body of an Okami, a Japanese demon. Last season, Bobby made a deal with the demon named Crowley in order to stop Lucifer. (He also got healed from paralysis, allowing him to walk again.) He had to offer his soul up to Crowley, but it was sort of a short-term deal … Crowley promised to “rip up the lease” when they beat Lucifer. In the first few moments of this episode, we see that Crowley didn’t hold up his end of the deal. In a flashback to a year previously, just after Lucifer’s fall, it’s revealed that Bobby summoned Crowley about getting his soul back. Crowley says he can’t do it, citing a loophole in the contract that says he’d make his “best efforts” to give back his soul, which means “I’d like to — but I can’t.” Crowley gives him 10 years to live before collecting. Bobby’s attempt to capture Crowley in a Devil’s Snare is thwarted because Crowley summons hellhounds, forcing Bobby to let him out. Back in the present, Dean and Sam are investigating a series of vicious murders, where the only clue is a strange-looking claw. They call Bobby to help out with the investigation. Bobby takes a while to answer the phone, because he was busy, but decides to help the boys anyway. After a full night of coffee-fueled research, Billy figures out that the boys are hunting a Lamia. “It’s a monster. Juices hearts, chugs the blood. Never heard of one popping up outside of Greece, though.” It can be killed by a silver knife blessed by a clergyman. Dean then hangs up the phone without so much as a “Thank you.” Those boys can be a bit ungrateful sometimes. “You don’t recognize them? They’re yours,” he replies. “Then you got nothin’ to worry about,” Bobby says. He then fires the flamethrower into the barrel, but the demon woman seems to be burning from the inside out. My guess is that he has her bones in the barrel. Burning up a spirit’s mortal remains destroys it, but I’ve never seen this principle applied to demons. The demon then replies that she can’t, because he’s the king. Crowley’s title was “king of the crossroads,” but now he’s upgraded. It seems that with Lucifer gone, he’s the new King of Hell. After Bobby takes a break to get rid of a cute and awkwardly flirtatious new neighbor who knocks on the door, the demon finally offers up the name Fergus MacLeod … then Bobby kills her. After the commercial break, Bobby has a series of rapid-fire phone calls. See, he’s kind of the central hub for a network of hunters, where his primary role is to provide them with authentication of their cover stories. He’s got about a dozen phones rigged up on his wall, each marked to indicate how he should answer them – FBI, CDC, CIA, Fed Marshall, and so on. Rufus provides some information about Fergus MacLeod, including that he had a son who died in a 1723 shipwreck off of Massachusetts’ shore. The son had a signet ring, now part of a museum’s sunken treasure exhibit. Bobby asks Rufus to get the ring but things go sideways on it. Rufus swallows the ring while being chased. In fact, the whole episode is about Bobby asking for help. First, he asks Rufus for help. Then he asks Sam and Dean for help. Next, he asks the Sheriff for help in getting Rufus out of jail. With the ring now liberated – and sterilized – he performs a ritual to summon Crowley’s son. Rufus believes (and the viewer is meant to be led to believe) that he’s planning to trade the son’s spirit for release of his soul by Crowley. This isn’t what happens. Instead, he just summoned the son so that he could get the location of Fergus MacLeod’s burial site. (I was right. The bones thing works on demons, as well. Now that Bobby’s proven that, I’m guessing that demons will be more careful with their remains.) Sam and Dean are now in Scotland, so Bobby can trade his soul in exchange for not destroying his bones. With his soul back under its original ownership, Bobby thanks Sam and Dean for their help (almost as painful as asking them for help in the first place). Then, just as he’s about to eat dinner, the phone rings and he’s back to his existence as support staff to a vast hunter network. Monsters are behaving strangely. Stranger than normal, that is. A Lamia, normally only found in Greece, is located in Wisconsin and a Japanese Okami is also found in the U.S.
Demons can be destroyed if their bones are burned. 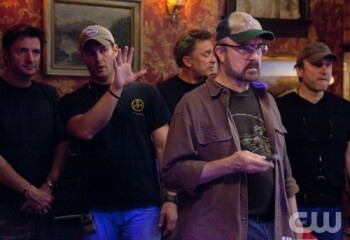 Supernatural's star, Jensen Ackles (hand raised), directs his first episode. The episode was also the directorial debut of Jensen Ackles, the actor who plays Dean Winchester, and showed some nice chops working on a cast that doesn’t work together a lot. Sam and Dean are sidelined, which makes sense, because that meant Ackles wasn’t in the awkward position of directing himself at the same time he was juggling all of his other duties.